Carl Van Vechten (1880 - 1964), born in Cedar Rapids, Iowa, in 1880, rose to become one of America's most prominent writers. Throughout his career, he had written seven novels, featuring the turbulent twenties, to go along with numerous collections of essays and short stories. Aside from being an acclaimed author, Van Vechten went on to become a widely regarded photographer, photographing such profound celebrities as F. Scott Fitzgerald, Gore Vidal, Billie Holiday, and Ella Fitzgerald. One of his many accomplishments was patronizing the work of the Harlem Renaissance. He died at the age of 84 in New York City. 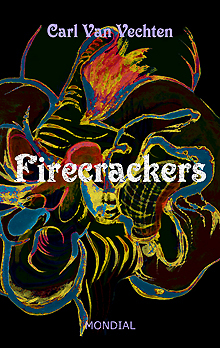 "Firecrackers is the least known of Carl Van Vechten's novels, probably because it has never been reprinted and all of the others have, some several times. Of the four (out of seven) novels that deal directly with what he called 'the splendid drunken twenties' in New York, Firecrackers was published at the heart of the period and comes closest to depicting the Jazz Age in all its variety. After eighty years, the novel will strike many readers as quaint or mannered or camp (or all three), butVan Vechten subtitled it 'a realistic novel,' and the hi-jinks from the period on which it reports are apparently accurate, although informed by a masked austerity. As early as 1925, Van Vechten saw the end in sight even if few others were looking ahead that far. Coming out in the same year as books as disparate as Fitzgerald's The Great Gatsby and Loos's Gentlemen Prefer Blondes, dealing with similar if markedly different milieus, Firecrackers bolsters our understanding of that strange decade. It extends the lives of some characters in Van Vechten's earlier novels, and it anticipates the frantic desperation depicted in his last one, Parties (1930), when the stock market crash brought the twenties to a thudding halt." Welcome to one of Carl Van Vechten's most intriguing, ironic novels. First published in 1925, Firecrackers centers around Paul Moody, a man who finds his life utterly tedious and uneventful in New York City. However, that is until he encounters the mysterious, yet exuberant, Gunnar O'Grady. Moody tries to uncover the mystery of his young friend, while also desperately seeking his own purpose in the world. Though, little does he know that his life and the lives of those around him are about to be changed forever. Humorous, poignant, and ironic, Firecrackers boldly stands as one of the most definitive portraits on the excesses and recklessness of the Jazz Age. In conjunction with the Carl Van Vechten Trust, Mondial is set to republish the late author's long-unprinted novel, Firecrackers: A Realistic Novel. In what must be considered a milestone, the book will be published after being out of print for over eighty years; thereby poising to become a lost find for readers and literary scholars alike. First published in 1925, the novel centers around a wide cast of characters whose lives are irrevocably changed by the mysterious Gunnar O'Grady in 1920s New York. Though, like most Van Vechten novels, there is more than actually meets the eye. Bruce Kellner, "Successor Trustee" to the Estate of Carl Van Vechten, says the republication of Firecrackers is important, because the book "bolsters our understanding of [the twenties]" and "comes closest to depicting the Jazz Age in all its variety." The book also uniquely explores the true meaning of happiness and the eternal search for self-identity, through humorous, thoughtful, and often poignant characters. Though, Kellner believes what makes Firecrackers truly unique is that the book "anticipates the frantic desperation…when the stock market crash brought the twenties to a thudding halt."